Images Aloft can provide your company with a turn-key operation. With an FAA licensed pilot and ground crew, plus support chase vehicle and all the gear necessary for a safe and successful promotion. We have years of experience, and many corporate references. When appropriate we include your company guests and associates with flight preparation activities, further instilling a sense of pride and team building with your brand. Colorful branding of the chase vehicle and crew uniforms completes the package, a memorable impression to all who see. Images Aloft is an exclusive representative for Cameron Balloons, with factories in Bristol, England and Ann Arbor Michigan. Cameron is the largest manufacturer of hot air balloons in the world. 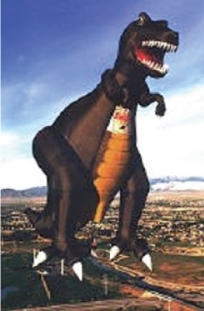 A custom built corporate advertising balloon is built to FAA standards by skilled craftspeople, using digital inkjet printing techniques to faithfully reproduce any company logo. We equip our balloons with "rotation vents" that enable the pilot to effect a pirouette in mid air, and ensure the company logo is facing the crow and the media at all times. For night-time operations, we employ a special interior lighting package that will have your corporate logo glowing like a beacon to all. If you can dream it, we can build it. No Corporate Icon is too complex. From flying bottles to castles in the clouds, CAMERON BALLOONS has built them all. Airborne mascots like the Energizer Bunny, Mr. Peanut, the Michelin Man, Tony the Tiger, Mickey Mouse and Mr. Potato Head have taken flight as hot air balloons. Images Aloft has "generic" balloons specially designed for temporary logos. The artwork is reproduced on a nylon banner blank and attached to one of our colorful balloons with velcro, producing a seamless effect that looks like your own custom built balloon without the cost and commitment. You may rent our balloons for one flight or many. And we will provide everything you need. Images Aloft pilots have flown corporate balloons at many events worldwide. From the Super Bowl to the US Open, we've been there providing our clients with the maximum exposure. Any outdoor event where people are gathered will become your showcase to project your message upon the masses. When a free-flight is inappropriate we can tether the balloon with long ropes, allowing for short flights with multiple passengers. 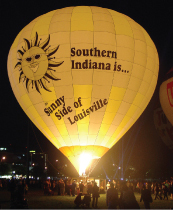 Sometimes a static display is in order, and the balloon provides a colorful backdrop for a concert or sporting event. An average size balloon can accommodate two passengers plus your pilot, and we often invite along media representatives for a tv news story or a live radio remote. New technology will allow us to digitally project digital video on a static balloon at night, for a larger than life dynamic display platform. Ballooning entrepreneurs Kathy & Jerry Copas have been in the hot air business together nearly 25 years. 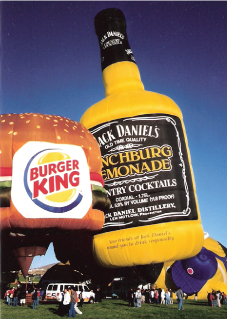 Jerry and Kathy have flown and or managed hot air balloon advertising programs for a variety of companies like Jack Daniels, Michelin, Caesar's Palace, Safeway Supermarkets, Motorola, Oldsmobile, Domino's Pizza, and Early Times Whisky. They take their roles as "corporate ambassadors" very seriously, promoting the companies they represent with a positive, professional attitude. They have an exemplary safety record, and are both certified flight instructors, having trained many new area pilots over the years. Their ballooning careers have taken them all over the world, and to most of the U.S.A. They have operated balloons in such varied locations as The Australian Outback, the Swiss Alps, and the Las Vegas strip. They have had professional media training with Edelman's Worldwide, and are adept at positive product promotion through print, radio, and television coverage.